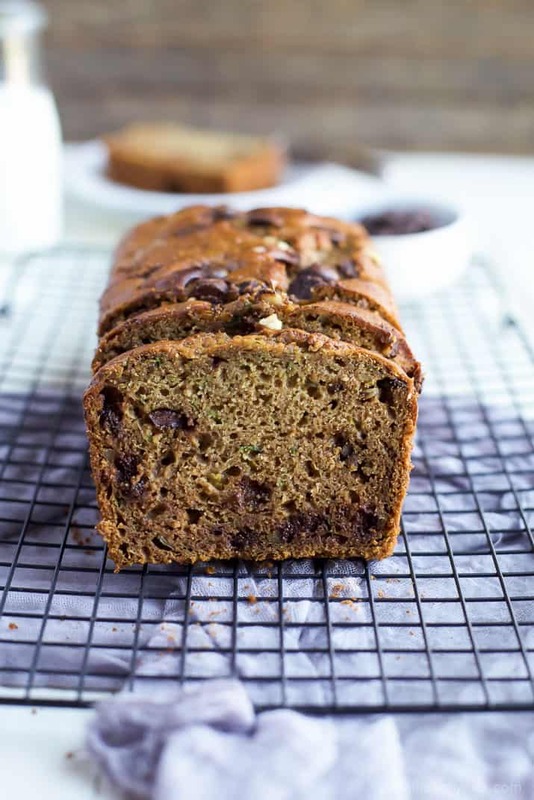 Chocolate Chip Zucchini Bread – it’s the Zucchini Bread Recipe you’ve been waiting for! This bread is moist, healthy from a few simple swaps, and down right deliciously addicting! Does your mind ever go all over the place? I finally had time to think, to sit down, be silent and focus …. but my mind is going a million miles a minute. There’s so much stuff I want to do. I want to improve my blog, I need to fix a few glitches, to make it look pretty (cuz we all know a girl needs things to be “pretty”), to improve the way you search for recipes, to improve my business and grow my network with brands … the list goes on and on. Then my mind starts going to my family life. How I can continually work on teaching Cason character lessons about things like respect, having a kind heart, being confident, being PATIENT, and being thankful. I want to have people over for dinner, but we haven’t done that since we moved. I want to finish designing the new house we are going to build! I want a date night with my hubbie … oh and see the new Jason Bourne movie! My list is getting bigger as I keep writing. Sheesh! Does anyone else have a list like this? One that just keeps growing and growing? The problem is life happens and I don’t get to mark those things off my list .. and if you know me … marking things off “my list” is important to me. I will even write something down on my “to do list” that I have already done, just so that I can mark it off! haha.. I know pretty pathetic! But it makes me feel accomplished! I don’t think there is anything wrong with making lists or even having a running list of larger items that you want to someday accomplish. The problem is when the list starts to define you and you measure your “accomplishments” or “success” by how much of that list you’ve finished. So … here’s to throwing the list out the window! Err…. not throwing it out the window cuz I can’t do that … I like my list … but NOT letting it define us! Can I get an amen! 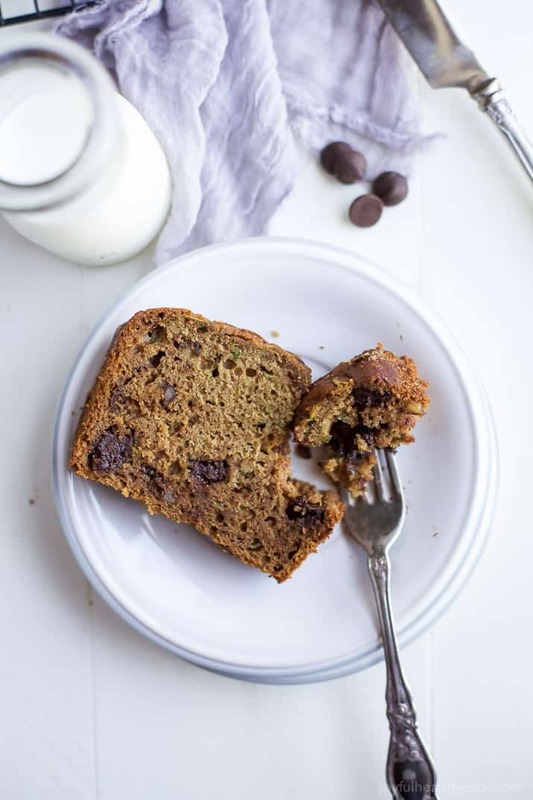 In celebration of our new found freedom let’s celebrate … with Chocolate Chip Zucchini Bread. Shall we? Just so you know and you don’t get mad at me later. This bread is seriously addicting and is crazy moist. There are no if’s and’s or but’s about it… most likely you will have 2 pieces at a time. It’s that good! Or maybe you won’t and I just have self-control issues. Either way you’re gonna love this bread. 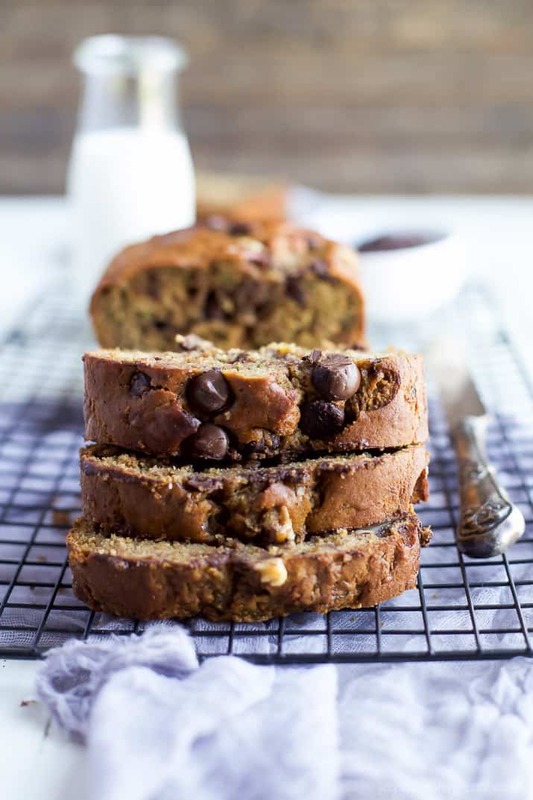 It’s loaded with zucchini (woohoo), made with whole wheat flour, honey (instead of sugar), has a nice warmth to it from the cinnamon and nutmeg, a crunch from the walnuts, with dark chocolate in every bite! You can’t get better than that! 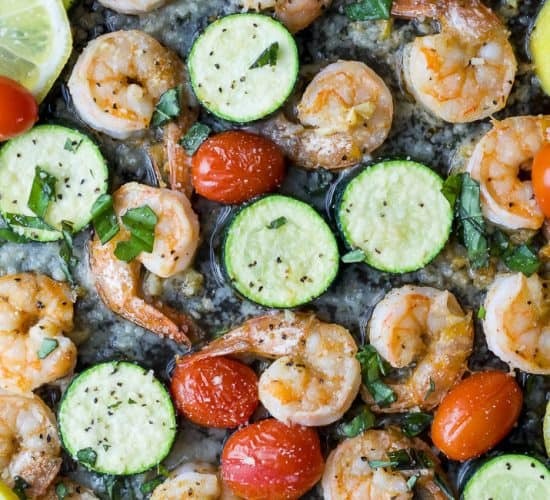 Bon Appetit sweet friends, hope this recipe gets you through the rest of the week! Prepare a 8×4 loaf pan by greasing the bottom and sides (you can grease with coconut oil, butter, or PAM cooking spray) Lightly dust with flour and shake out excess flour. In a medium bowl, add flour, baking powder, baking soda, salt, ground cinnamon, and ground nutmeg. Whisk together. In a large bowl, add honey, unsweetened applesauce, coconut oil, egg, and vanilla extract. Whisk together until smooth. 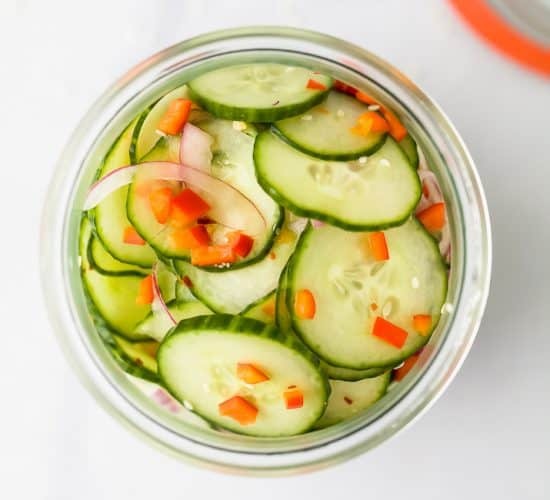 Squeeze grated zucchini to remove any excess liquid. 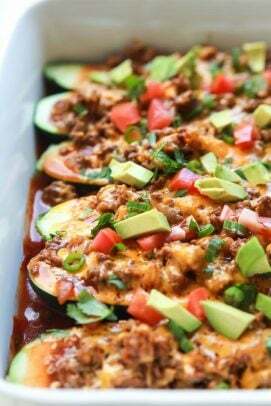 Fold in the zucchini, chocolate chip, and walnuts. Add the batter to prepared loaf pan. AMEN!!! I am the same way with lists—they cover all the fun things I want to do and all the productive things. Give me a break, freedom and ALL THE ZUCCHINI BREAD! I wish I could just reach into the screen and grab a slice right now! Now I really can’t wait till we start getting lots of zucchini from our CSA! haha.. right! Bring on the zucchini! 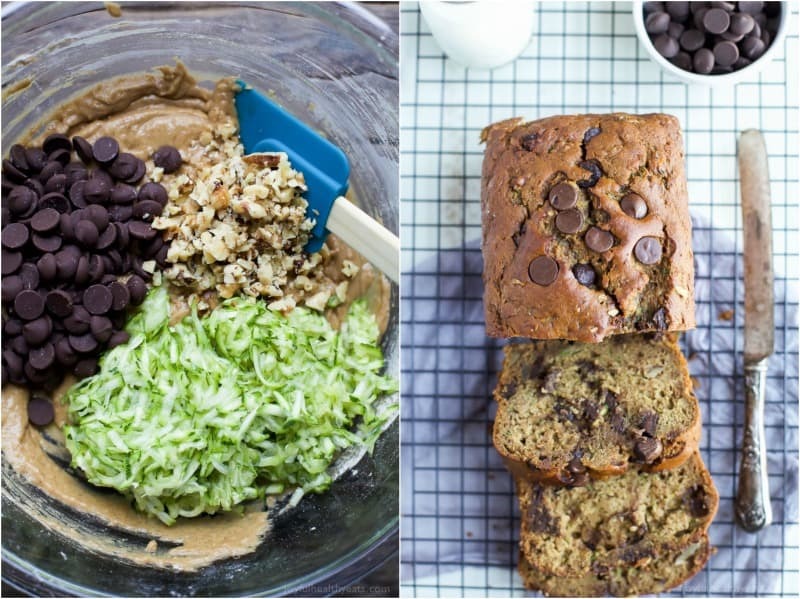 Seriously looks like the best zucchini bread ever! LOVE it! Ohhh, Mama, I told myself I would not make zucchini bread with all the zucchini I have from the garden but you are making me re-evaluate life! Sooo good! haha… do it! Give me .. it will be the best decision you ever make! ucchini bread is the best! It is a must every year with my zucchini! Yum! 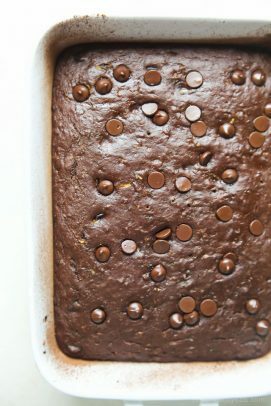 I have a recipe for regular zucchini bread, but I’m crazy for chocolate, so I love that you added chocolate chips. 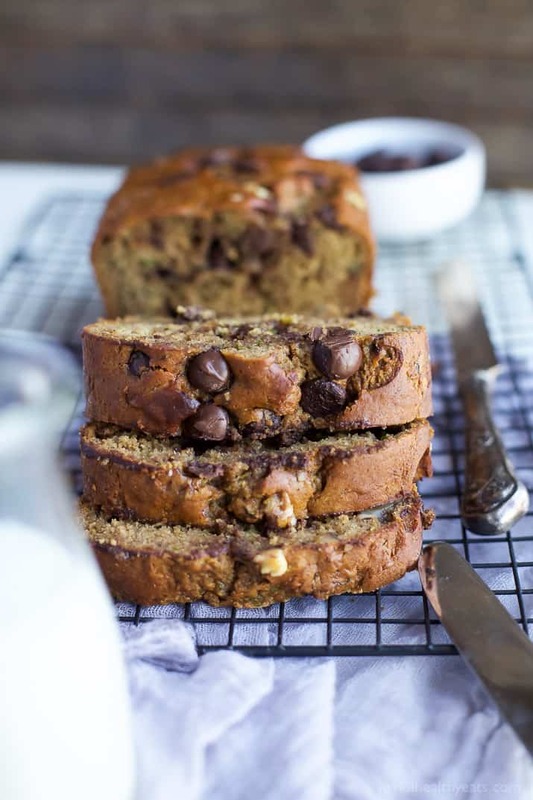 I love zucchini bread, especially with chocolate. This looks absolutely amazing. Chocolate and Zucchini is the BEST combo ever! oh man, I am the QUEEN of writing stuff on my list that I’ve already done and crossing it off. so satisfying! What is wrong with us!! haha. Your list sounds daunting and very similar to mine, and makes me want to take a nap. OR just netflix with a plate of this warm bread.<<that please. I’m pretty sure we need to meet up, tear up our lists, make a bowl of soup, some warm bread and binge watch netflix. Deal? Oh, I hear you on the list thing. I, too, write things down just so I can cross them off! 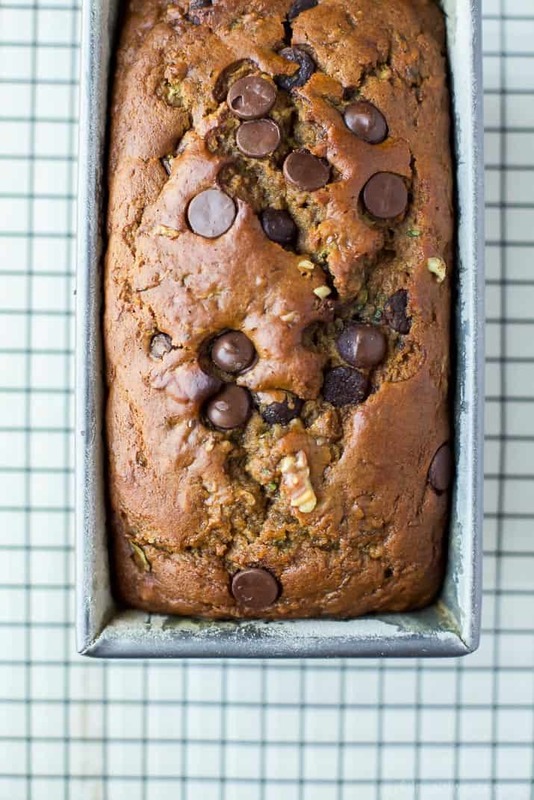 Well, you can certainly cross off “post perfect zucchini bread” because this looks so good. Beautiful list of ingredients. LOVE!! Thanks for the recipe! 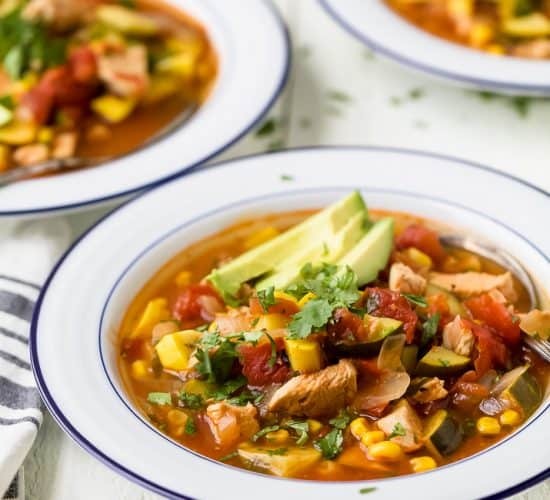 Ready to make this–it sounds so yummy! Please confirm the pan size??? My loaf pan is 9×5??? Hey Sandy, yes I have a 9×5 as well. So you’re good to go! SO yummy. Zucchini bread is amazing, and I would love to try making my own! Once you make your own, you’ll be hooked! Very yummy recipe! 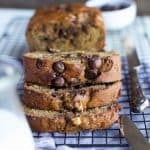 Will definitely be one of my new go to bread/muffin recipes! I say muffin because I it made it into 36 mini-muffins, which I baked for 13 minutes to perfection. I love the hint of nutmeg in them too! Beautifully moist and delicious! Oh, I had a little too much zucchini grated so I used 2 cups instead of the amount called for, didn’t seem to matter. what exactly is applesauce? Can i substitute it with something else ? This looks delicious. applesauce is cooked and pureed apples, you could probably just omit the applesauce if you don’t want to use it. It will still be super moist from the zucchini. Wow! Made this today as muffins, made 11 good size. I didn’t have nutmeg so added extra cinnamon. I also added 1/4 cup of unsweetened roasted coconut. Absolutely amazing! YUM!!! Totally gonna do that next time I make these! Ohhh so glad you liked the flavor. Major bummer that the bread didn’t turn out. I’m actually gonna be making it again this weekend so I’ll make adjustments to the recipe if it needs a longer cook time. Thanks Melissa! This is exactly what happened to me, passed the toothpick test, but after 55 minutes still raw on the inside. I was so looking forward to it, as it looked so good! I have since updated the recipe to squeeze the zucchini before hand. hope that helps. Love the photography. It definitely drew me in. Made a double recipe so we could eat one now and freeze one for later. My kids loved it, but for all of the ingredients it required (who keeps coconut oil in their pantry? and why would you want to?) I expected more. The baking temperature was either too hot or the cook time was too long as they come out very dark and crunchy on the outside under the conditions described. The recipe also calls for an 8×8 loaf pan. But all the pictures are clearly not from an 8×8 pan. What kind of loaf pan is square? Hey KE, sorry about that. The 8×8 was a typo I changed it to 8×4 which is what is should be and what the photos show. 🙂 Glad you’re kids liked the recipe. Not done in middle after 55 minutes. Trying for 10 more. Can I substitute gluten-free flour? sorry anna it should say 8×4 loaf pan. I’ll edit the directions for clarity! 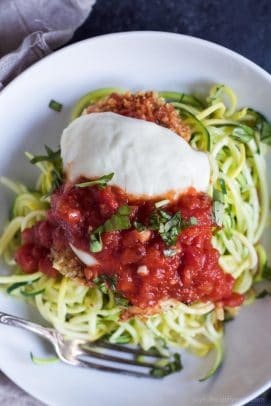 Do you squeeze out excess juice from your zucchini once it is grated or do just put it in just as it is once you grate it. Please let me know. I squeeze it out so that the bread cooks correctly. Hope that helps. I have made this several times now! It is a big hit with the whole family and I feel like I’m sneaking some healthy foods into dessert. 😉 Love your recipes! Thanks for sharing. haha.. yeah for mom wins! Love it Lindsey! This looks so good! But I have a couple of questions, why use both baking powder and soda, and can I sub it for all-purpose flour and still get the same results? Thought this recipe was super yummy, from what I could taste. I followed the directions exactly and cooked it for 40min to be safe but it wasn’t done in the middle. I cooked it for an additional 10min and it still wasn’t done so I cooked it for 10 more and it still wasn’t done in the middle! I see some other folks had this issue too, am I doing something wrong? I used a 8×4 loaf pan but should I use a different one? Did I possibly stir the wet ingredients into the dry ingredients too much? No. I have actually modified the recipe since then. The zucchini when baked was making the bread super moist and leaving it uncooked in the middle, if you squeeze some of the liquid out before adding the grated zucchini to the batter it comes out perfect! This is pretty good, but too sweet. I’m wondering if it would bake as nicely with half the choc chips, half the honey, and more zucchini to replace the moisture from the honey? You could definitely try that if you thought it was too sweet.